We are only passing on the costs associated with getting the item to you safely and in one piece. Very Good Condition. REST OF THE WORLD: International. Vintage Falcon ware /sylvac pottery Hand painted. Vintage Falcon ware No 455. pottery Hand painted. 19cm height A lot of work in making this Jug / vase beautiful detail. I don't see any cracks or restoration. It will be well wrapped and Dispatched . Thanks for looking you may be interested in my other items. Set of 3 Flying Ducks. Falcon Ware. 1940s/50s. They are printed with ‘Falcon Ware’ Made in England. 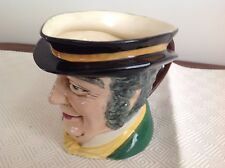 A T Lawrence Falcon Ware Toby Jug. One small chip at the bottom of the jug on the right hand side. Vintage Falcon Ware Teapot or coffee pot.Design Has Thatched cottage near bridge with Lady in cottage garden.Bridgemere.makers mark on Base,impressed Paris,5122 .Height 7”.length 6.5”.slight wear on gilding,crazing otherwise In good condition.Will post Worldwide so please ask postage price before bidding.Tracked postage is recommended so that if goes missing can be traced.I will not take responsibility if you opt for uninsured postage. Will do combined postage. Vintage 1970s Royal Falcon Ware. Weatherby Hanley. Plate. 1970s Plate by Weatherby Hanley Royal Falconware showing a mill scene by J C Van Hunnik. Falcon Ware Sylvac pottery Cat Jug 45. Approx 5” high No chips or cracks but a manufacture hole see photos Please ask all questions before placing your winning bid Condition is Used. Dispatched with Royal Mail 2nd Class. A fine Falcon Ware early Sylvac Art Deco pottery Sack Jug #406. which dates from the 1930's. Item number:- 3129 - 090. Cromwells Antique Centre is open. Approx 11 cms tall x 16cms length. Lovely decorative piece or for use. Nice shell design. Lovely gift idea. Or for collector of Falcon Ware. Made by: Falcon Ware. Markings: Made in England, Falcon Ware. Material: Pottery / Ceramic. Age: c. 1950's. Colour: Green. Purchasing more than one item ?. Marked on the base with the Falcon backstamp. In very good condition. The heights of the jugs are 7.25ins, 6.5ins, and 5.75ins. sold as seen. Pair of Art Deco vases which were made by Royal Falcon Ware in the 'Durability' range. They each stand 23cm tall and are both stamped as shown on the base. One is in excellent condition and the other one has a small hairline crack (as shown in the photo) but would still make a great display piece. Any questions please do not hesitate to contact me. Royal Falcon Ware Durability J H Weatherby Biscuit Barrel Circa 1930 - 1940.